The Jin Mao Tower in Shanghai may no longer be the tallest building in mainland China but it can still boast having the highest post office in the world. 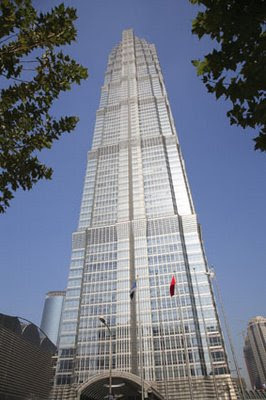 It lost its vertical status to the 101-storey Shanghai World Financial Center which was completed last year. Jin Mao, completed in 1998 and 1,381 feet tall, is an integral part of the ever changing Shanghai skyline. It is located in Pudong across the Huangpu River from the Bund and next door to the World Financial Center. The building houses offices and the swanky Shanghai Grand Hyatt Hotel on floors 53-87, which lays claim to the world’s longest laundry chute. An indoor observation deck is located on the 88th floor. It’s no coincidence that eight is an auspicious number in China. 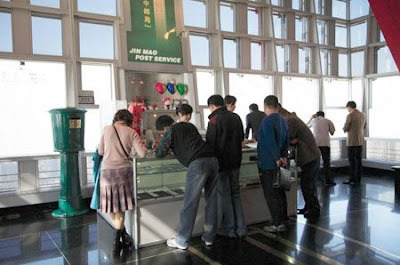 It’s well worth a visit to the observation deck which has sweeping, panoramic views of Shanghai. A good time to go is early morning before smog shrouds the city or at dusk, when you can stay until dark, write and mail those postcards you’ve been meaning to send and watch the city light up. It’s open 8:30 a.m.-10 p.m. and costs RMB 50, about $6. To get there take the metro to the Lujiazui stop. Fan’s of Taiwan's Taipei 101 Tower, which is no longer the world’s tallest structure, can take solace that it is still taller than Shanghai’s World Financial Center. The Burj Dubai has surpassed Taipei 101 as the word’s tallest structure and will dethrone Taipei 101 as the world’s tallest building when completed and open. Too good architecture. If I remember I have been to 20 floor maximum in my life and city-look from the top is amazing as well as scary. I am dreaming what if I reach 101. That is a height. Whew! Just looking at it makes me dizzy. I wonder why the Chinese continue to build such towering buildings in light of eco concerns? Oh my, when is the race to sky going to stop? Nonetheless, I always enjoy keeping tabs on the tallest building of the world. I enjoyed all the bits of info/stats incorporated in this post. Sorry I couldn’t visit you for the last two weeks! I’m trying to catch-up and see the wonders you have around! Loved to see the Tokyo street scene! It was what impressed me more the first time I went there in 1983... Amazing!! Meanwhile, one of the most beautiful Forts in India waits you and your comments at Blogtrotter: – The Amber Fort! Enjoy and have a great weekend! Hobo, If you have a fear of heights it could make you dizzy. Fly Girl, Shanghai is very polluted at times.